Galapagos’s main island are San Cristobal, Santa Cruz and Isabella; their calling ports are Port Barquerizo Moreno, Port Ayora and Port Villami respectively. Loading operations at Guayaquil take place at a shore terminalwere cargo call takes place during five (5) day time. Vessel crane and pay loaders are used to move cargo from ship side into cargo holds. All cargo received at port is loaded / stowed during working hours that runs seven days a week on day light time. No storage on warehouse or even on berth sides takes place. 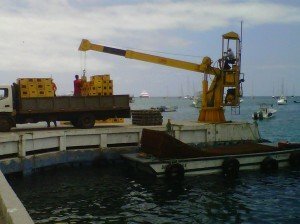 Main ports in Galapagos Islands are of open bay nature, and unloading operations are conducted via ship lighterage therefore affected by climate conditions. Such operation is conducted only during day light hours, from Monday to Saturday Noon Time;ship cranes and vessel cargo ramp are used during the process of loading small wooden cargo hold barges with a maximum capacity of 400 MT. 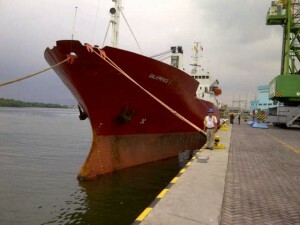 At shore, barge unloading takes place directly into truck since no warehouses are available. Only at Port Baquerizo Moreno those operations are assisted by a crane with a max SWL of 7 Tons. For heavy equipment- rolling stock cargos – a landing craft unit is employed, which is based at Port Ayora. Our ship performance at sea runs with the strength of Lloyds Class, fully equipped for the trade. High management standards and a thought out maintenance allows us a secure sea transit minimizing inherent risk associated to any maritime adventure…. 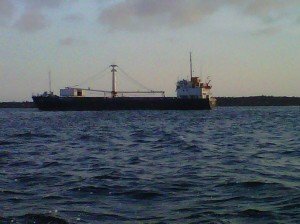 Equipped with a 20Tons main gear and auxiliary cranes for fastening cargo unload our ship remain unmatched in Galapagos trade, while allow us handling special cargoes with significant large / weight…. With two cargo holds and 4 storage / decks we can segregate cargoes in attendance of destination or its own specifics / requirements. Your cargo is our responsibility and we are prepared to comply with the most demanding requirements….